Witherspoon during a Sevendust concert in May 2010. 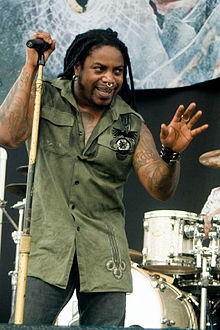 Lajon Jermaine "LJ" Witherspoon (born October 3, 1972) is an American musician best known as the vocalist for the Atlanta-based alternative metal band Sevendust. Members from bands such as Staind, Seether, Alter Bridge, and Diecast have listed Witherspoon and Sevendust as musical influences. In March 2008, Witherspoon was recognized in Hit Parader as one of the "Top 100 Metal Vocalists of All Time." He was ranked number 35, placing over numerous famous rock vocalists such as Bret Michaels, Scott Weiland, and David Bowie. Lajon Witherspoon was born in Nashville, but grew up in Atlanta with his parents, along with his brother Reginald Ladon Witherspoon. Witherspoon's father was a singer in a funk band when his family lived in Nashville. Before getting into music, Witherspoon played football and wrestled for Norcross High School. He also practiced judo for a number of years, but eventually chose music over sports as his primary activity. Before his days in Sevendust, Witherspoon was the frontman of a soul group, Body & Soul. In 1994, his group supported local group Snake Nation, at a gig. Impressed by his vocal abilities, Vinnie Hornsby and Morgan Rose asked Witherspoon to sing for their band. Guitarist John Connolly, the former drummer of the Piece Dogs, and Lee Banks joined them to form Rumblefish. The name was soon changed to Crawlspace. When the band's schedule proved too much for Banks, Clint Lowery from North Carolina's Still Rain replaced him. The band had to change their name again when a group on the west coast claimed the rights to it. Struggling with a new moniker, the members settled on Sevendust after Hornsby found a can of "Sevin Dust" (a pesticide) in his grandmother's garage. On Saturday, November 9, 2002, Lajon's brother Reginald (age 21) was fatally shot in Nashville, Tennessee. Lajon heard the news from his father just minutes before the band's performance in St. Joseph, Minnesota. His father urged him to go on with the show and dedicate it to Reginald. Sevendust had postponed all shows until November 15 where they performed in Hampton Beach, New Hampshire. Lajon Witherspoon recorded a song titled "Ready to Go" for the NHRA's 10-song compilation, released on June 1, 2010. He has talked about recording a solo project after the end of the touring and promotion cycle for Sevendust's ninth record, Black Out the Sun. Recently he has released a single titled "Love Song". "I think it resonates with what's going on in the world today," says Lajon Witherspoon regarding the inspiration of the song. Lajon Witherspoon has a wife, Ashley Witherspoon, and two daughters, Maya Diane and Jada Legend Witherspoon. Lajon and his wife recently had a son. Lajon Witherspoon currently lives in Olathe, Kansas. ^ "Hit Parader’s Top 100 Heavy Metal Vocalists of All Time". Hit Parader. Retrieved 2010-07-16. ^ "Top 100 Heavy Metal Vocalists". Sputnikmusic. 2006-12-01. Retrieved 2016-01-14. ^ Charles (2000). "Lajon Witherspoon of Sevendust". Rolling Stone. 837. ^ "Sevendust Biography". Sing365.com. Retrieved 6 August 2010. ^ iconoclast entertainment group. "musicNEWS Nov 2002: Sevendust Frontman's Brother Murdered, Police Issue Statement". antiMUSIC. Retrieved July 14, 2011. ^ a b "Sevendust Front-Man Streams Solo Song "Ready To Go"" rawkpit.com. Retrieved on May 27, 2010. ^ "SEVENDUST Frontman Reveals Plans For Solo Project". Alternativeaddiction.com. Retrieved 31 January 2013. ^ "SEVENDUST Frontman Releases Solo Single, 'Love Song'". 4 September 2017. ^ "Sevendust Goes For "Human Beehive" Look In New Video - Music, Celebrity, Artist News". MTV.com. 1999-08-11. Retrieved 2013-03-25. ^ "News & Headlines". eyeempire.com. July 7, 2010. This page was last edited on 19 February 2019, at 06:42 (UTC).